What Is the Glycemic Index of Oatmeal? Thanks to its soluble fiber content, a simple bowl of oatmeal offers plenty of sustained-release energy. 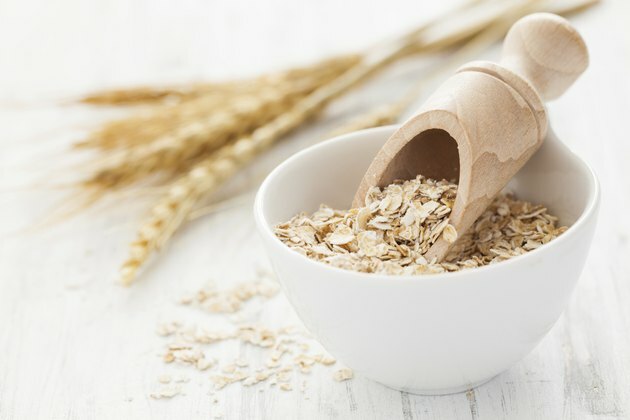 Depending on the processing and preparation of the oats, oatmeal has a low to moderate effect on your blood glucose level and insulin production. Eating foods high in soluble fiber such as oatmeal on a daily basis may help stabilize your blood sugar and lower your risk of type 2 diabetes, says the American Diabetes Association. The glycemic index, or GI, ranks the effect of a carbohydrate-containing food on your blood glucose level on a scale of one to 100. The higher the GI, the more quickly a food can elevate your blood sugar. The GI of a grain product may vary according to the way the grain has been processed and prepared. A 250 g serving of oatmeal -- a 9-oz. bowl -- has a GI of 58. A bowl of instant oatmeal has a GI of 83. The process of milling grains, such as oats or wheat, removes some of their fiber content, which accelerates digestion and raises the food's GI. If you want to reduce the GI of your oatmeal, avoid the instant varieties and try coarser, minimally processed oats. Oats have a lower GI than other grains because they provide both soluble and insoluble fiber. Unlike insoluble plant fiber, which does not dissolve in water, soluble fiber absorbs water and turns viscous. Rather than passing straight through the digestive system, foods with soluble fiber digest slowly, releasing the sugar content of a food at a gradual rate. Apples and beans are also high in soluble fiber. The Glycemic Index Foundation calls old-fashioned oats "slow carbs," because their soluble fiber content slows the breakdown of carbohydrates during digestion. Foods with a low GI help stabilize blood glucose levels, which keeps your insulin production within a normal range and helps to prevent type 2 diabetes, according to the American Diabetes Association, or ADA. Slow carbs such as oatmeal provide a source of long-lasting energy. If you're trying to lose weight, oatmeal and other foods rich in soluble fiber will satisfy your hunger and help you avoid overeating. You don't have to limit your diet to low-GI foods to keep your blood sugar stable, says the ADA. As long as the majority of the foods you eat have a low GI, they should balance out the effects of the high-GI foods. For a low-GI breakfast that includes oatmeal, add a protein such as yogurt, milk or an egg. Because proteins and fats do not have an immediate effect on blood glucose levels, they do not have a rating on the glycemic index. If you bake your own bread, you can lower its GI by replacing part of the wheat flour with oats. The soluble fiber in the oats will slow the digestion of the bread, reducing its effect on your blood sugar. If you're used to a bowl of instant oatmeal in the morning, try steel-cut oats, which have a heartier texture and a lower GI. How Many Calories Does a Bowl of Oatmeal Have? Does Whole-Grain Bread Turn Into Sugar?